This year, just as in the past two seasons – but for a vastly different reason – the Chelsea v Man U fixture has provided a litmus indication of the influence Alex Ferguson has held over the game of football in England since the inception of the FA Premier League in 1992. In the previous two meetings between the two clubs at Stamford Bridge, Ferguson was still very much in charge of Man U – and it showed. This season’s clash found the Pride of Devon under new management – and, boy, did that ever show too. Two years ago, it may be recalled, the game followed a pattern very similar to Sunday’s clash – up to a point. Chelsea established a three-goal lead by early in the second half on both occasions, but from then on the games followed very different paths. Back in February 2012, the brooding presence of Ferguson in the Man U dugout, together with the co-operative Howard Webb on the field, saw two penalties awarded to the away side as they swiftly reduced the arrears to a single goal. By that point, Chelsea were reeling, their confidence shot through, and it was clearly only a matter of time before an equalising goal. When it came, in the 85th minute, the build-up told its own damning tale. The sight of a demoralised Chelsea defender, attempting to close down a left-wing cross as he backed away, hands studiously behind his back, clearly convinced that a third penalty would be awarded if the ball could be struck against any part of his arms, was symptomatic of a refereeing culture dominated by fear of what Fergie might do or say if his side were defeated. It was like watching a boxer trying to avoid a knockout blow with his guard held down, a pitiful sight. In the event, two dropped points meant the title would end up with Manchester City – but Howard Webb had done his bit, as he did so often for the benefit of Man U. Last year’s game between these two at Stamford Bridge was even more indicative of where the power really resided. This time, Man U had raced to an early two-goal lead and it appeared that no undue interference with events would be needed. But two goals from Chelsea in four minutes either side of the interval restored parity – and suddenly the establishment’s favoured team were in danger of losing a game they had looked to have comfortably under control – and what would S’ralex say then, pray? That thought was plainly too horrible to contemplate for the referee, Mark Clattenburg on this occasion. His sending-off of Ivanovic for a foul on Young was reasonably clear-cut – but then Clattenburg made two decisions which demonstrated the influence of the Ferguson Fear Factor. Firstly, an already-booked Torres was clear and racing through on goal when he went down under challenge from Jonny Evans. If the foul were to be given, then Evans would have to go for a professional foul, and it would be ten-a-side. Clearly, that would not do – so Clattenburg brilliantly decided that Torres had dived, issued him a second yellow and made the contest 9 v 11. To cap a tremendously influential performance, he then allowed the clearly offside winner for Hernandez after 75 minutes, and Man U saw the game out against their demoralised opponents to bank the three points. Both of these games stand as damning evidence of what former referee Graham Poll admitted recently – that when officiating in a Man U game, it was always a relief to get the match over with, ideally with Man U winning – and certainly NOT having made any crucial calls against them, for fear of what Ferguson might say or do in retaliation. 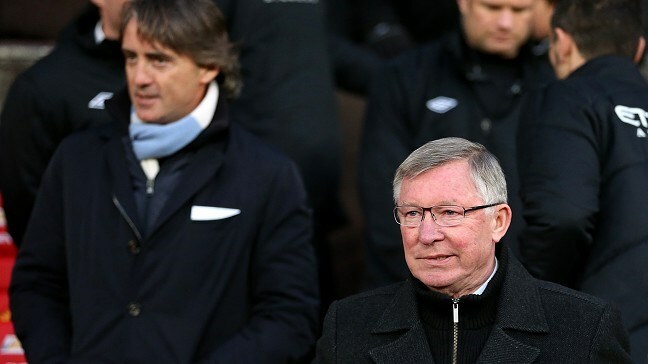 But for this year’s game, there was no Ferguson in the dugout – and the performance of the referee seemed suddenly free of those perceived pressures of the Fergie years. It’s not as though Man U didn’t try to apply such pressure. There were concerted efforts by their bench, with Moyes to the fore in his Fergie-Lite guise, to get David Luiz sent off instead of merely booked – to no avail. Penalty shouts – an ever-present feature of any Man U game – likewise went unheeded, despite the presence of the usual diving suspects. 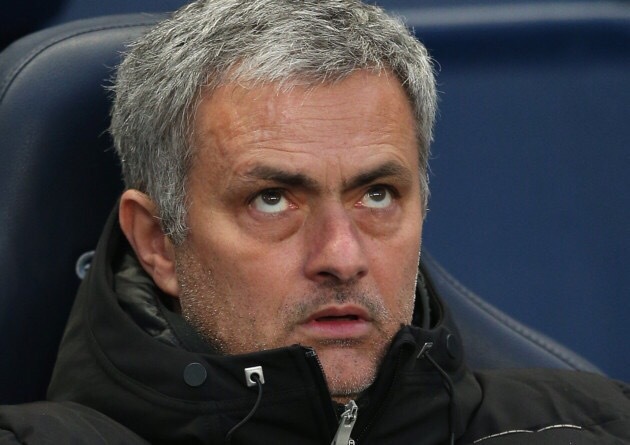 Chelsea, having eased into a three-goal lead despite a well below-par performance, never looked seriously troubled. In contrast to the two previous years, they never seemed to have the slightest fear that the game might suddenly turn against them. The referee even went so far as to dismiss Vidic and book Rafael for ugly challenges – decisions he probably got the wrong way around. The late-ish Man U goal might have heralded a late onslaught in previous years, with the winning side suddenly assailed by fear and insecurity – but that was when Fergie was on the bench. Now, with the impotent tyrant up in the stands, shaking his head glumly, there was no sign that the consolation goal would be anything but exactly that. Man U had been beaten, despite early dominance of possession, despite a lacklustre showing by Chelsea. It was their seventh defeat of the season, leaving them 14 points behind the leaders – or, more relevantly, a possible 7 points off Champions League qualification. Tellingly, people have even begun to speculate as to their main rivals for a Europa League place. It’s a new and unwelcome landscape for the ailing champions, and a lot of people are beginning to wake up to what all of this says, not only about their immediate prospects, but also of their record over the past twenty years, and to what degree that has been skewed by the ever more apparently crucial Fergie Fear Factor. Thirteen titles in twenty years – how many would they have won without the dubious methods employed by the Govan Gob? A virtually identical squad to last season’s runaway winners is now being revealed as the ordinary group that it is. The myth of Man U is being ruthlessly exposed – and while nobody could argue that this is good for them, or for their globally spread cadre of fans, including the tiny minority that actually attend matches – it surely has to be good for the game that such an evidently dominant force for the swaying of authority and the warping of results has now departed the scene. It would seem likely that history may not take quite such a rosy view of the Ferguson legacy as he would perhaps like – and the ironic fact is that this could perhaps come about not because of results under his leadership, but in the light of the pallid performance of virtually the same team, newly deprived of the advantages bestowed by the malign influence of S’ralex. If that turns out to be the case, then we may all be taking a somewhat more realistic view of those so-called Ferguson Glory Years. Happy Days Are Here Again – Bring On the New Season! The best football season since the mid-eighties (apart from 1991-92, obviously) is almost upon us. Despite the recession, austerity, bankers bonuses and the scandalous price of a pint, I’ve rarely felt so positive and optimistic about the immediate future. Even the fact that Leeds United are crap, and will almost certainly remain crap despite the best efforts of poor old Brian McDermott, my outlook is one of sunny anticipation and excitement for the feast of football that awaits my tired and cynical old eyes. And why? I’ll tell you why. It’s because Fergie’s gone, that’s why. Say it again and say it with relish. Fergie. Is. GONE. Don’t get me wrong. It wasn’t his annoying habit of winning things for the Mighty Man U that bothered me. It wasn’t his oft-paraded bloody stop-watch held up as a mute instruction to the ref regarding time-keeping. It wasn’t even his arrogance over whether he chose to adhere to various rules which bound other managers, things like press interviews, his notorious BBC ban, stuff like that. The fact that he clearly considered himself above mere rules was irritating, but not on its own the reason why I loathed him so much. It was none of these things in isolation. And after all, when he lost it was such a pleasure. Thank you Leeds in ’92, Blackburn in ’95, City in ’12 and a few others. But it didn’t happen often enough, and really, he was almost as horrific in defeat as he was in – shudder – triumph. 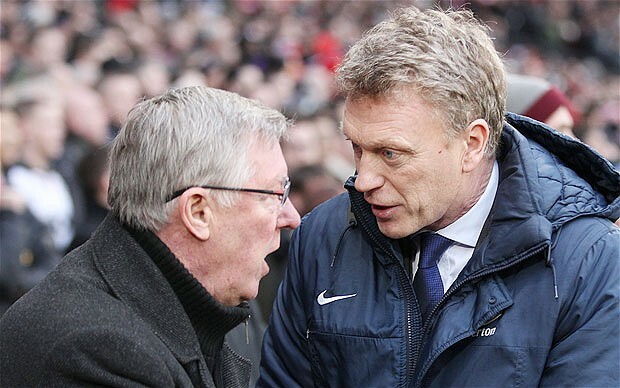 The real problem with Fergie was the sheer, all-round, ever-present, all-pervading unpleasantness of the man. His particular brand of arrogant Glaswegian gittery and the way in which he held sway over the entire game and media too – the whole Fergie package – that’s what got my goat. Whoever we support, we’ll have had managers who crossed the line in this or that respect, and made you see why fans of other clubs regarded them as less than nice. But Ferguson exceeded all these limits, most of the time – and not in a good way. Comical defeats apart, I really can’t think of a solitary redeeming feature. If I absolutely HAD to put my finger on one thing that annoyed me above all else – it was the demeanour of the man when he was happy, when he’d just won or when Man U had scored a goal. Sadly, these events happened all too often, and the results were always utterly repellent. When the Mighty Reds scored, there he’d be, emerging from his dug-out in that annoying daft old man shuffle, fists clenched and waving in uncoordinated celebration, casting a glance of odious triumphalism at the sullen members of the opposition coaching staff, champing away happily on his ever-present wad of gum while his nose throbbed an ugly shade of victorious purple. A most unpleasant sight. Happily though, it is one we shall behold no more. Fergie has retired upstairs, where his baleful presence need be of concern only to the inheritor of the poisoned chalice, David Moyes Esq. Moyes may wish to cast his mind back 43 years to the effect a newly-retired but still-powerful-in-the-background Busby had on HIS successor. But that is his problem. All we need wish is that an early and unceremonious exit for Moyes – should he fail – isn’t a signal for the caretaker return of the Govan Guv’nor, just when we all thought that nightmare was over. Perish the thought. So I’m really looking forward to a Fergie-less season, and even to the slight bewilderment of the assembled media, who will be wondering where to brown-nose, who to target for their obsequious flattery. Again, their bereft sadness is not my problem. I’m just going to enjoy the football scene as it will appear to me – bright and shiny, replete with promise and optimism after the removal of that horrible, nasty man. Man U will be that bit more difficult to hate, with the really-quite-likeable Moyes in charge, however long that lasts. But I’ll manage, it’s in my DNA as a fan of the One True United after all. And Mourinho is back, and Wenger is still there – men you can’t help but respect and admire. It’s going to be a good season in the Premier League, something I can really enjoy for once, whatever my beloved Leeds United do to screw things up one division lower. And it’s all thanks to That Man finally being gone. Hallelujah!! Man United – Why Always Them? Former Manchester City maverick Mario Balotelli will be remembered in the English game for many things, but prominent among those various goals, skills and misdemeanours will be his famous celebration after scoring against Manchester United at Old Trafford last season in City’s 6-1 eclipsing of their local rivals. 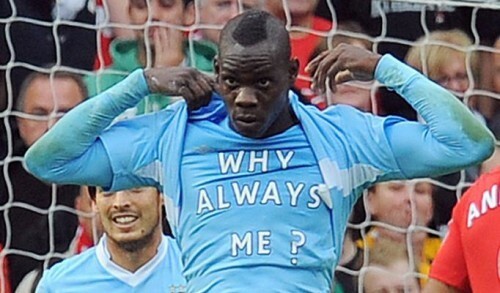 Balotelli slotted the ball home calmly at the Stretford End, turned away with no sign of emotion on his face, and lifted his City shirt to reveal a t-shirt on which was printed the heartfelt plea “Why Always Me?”. The message, after a series of incidents culminating in a row with the emergency services when he set off a firework in his bathroom at home, clearly indicated a feeling that he was being scapegoated to a certain extent. To add insult to his perceived injury, he was booked for the t-shirt display. Recent events, on top of a long history of prominent stories figuring the controversy and fuss that attend one football club above all others, might lead us to ask a somewhat wider version of the same question. Why is it always Manchester United? The furore surrounding their Champions League exit on the 5th March is fairly typical of the controversy the Champions-elect seem to attract, like flies to a bad piece of meat, on such a regular basis that you tend to wonder whether it’s just coincidence or a Machiavellian form of press-management. So “enraged” was manager Alex Ferguson after their defeat, which turned on the dismissal of Nani for what might charitably be termed a high tackle; that he refused to appear before the assembled press after the game. He was “too distraught” apparently, to fulfil his mandatory duties in that regard. To the media of course, a story about a no-show from Ferguson is a much bigger scoop than anything most managers might say in adhering to their agreed obligations. But Manchester United and controversy have gone together like port and nuts for a long, long time now. Closer examination of the incident in focus this time reveals a worrying lack of consistency in Ferguson’s emotional reactions over remarkably comparable incidents. Nani’s liver-high tackle was described dogmatically as “definitely not a red card”, paving the way for Man Utd claims of ill-treatment and bias. A virtually identical tackle some time before, by Arsenal’s Eboue on Ferguson’s own player Evra, was also punished by a red card, but that one drew praise from the choleric Scot, who stated that the decision was “100% correct”. This apparent self-contradiction is nothing new in the world of Alex Ferguson, or indeed in the wider manifestations of the club who like to brand themselves “The Greatest in the World”. At the end of the Real Madrid match, enraged home defender Rio Ferdinand saw fit to get up close and personal with the referee who had dared dismiss Nani, sarcastically applauding him at point-blank range. This is a widely-recognised form of dissent, and would normally merit a yellow card. 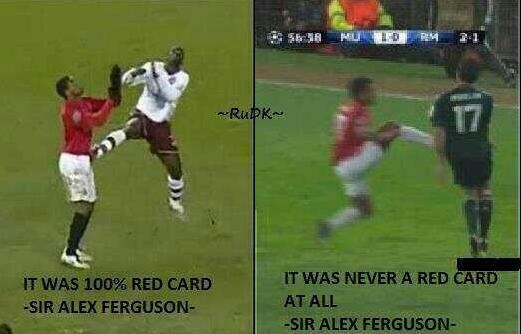 The referee did nothing, and UEFA have since confirmed that no action will be taken against Ferdinand. It would be tempting to ask what sort of message this sends out to aspiring young players, if the answer were not so glaringly obvious. That message is, as ever: Man Utd can basically do just as they like, the game’s ruling authorities being so much in thrall to the club’s global profile – and the markets dependent upon its prosperity – that they will often turn a Nelsonian blind eye to such flouting of the rules, in the fond hope that nobody will notice when other clubs are dealt with more severely for like offences. This sort of thing has been going on for many years, and while most clubs might shy away from such regular media attention of a not entirely positive nature, Man Utd as an entity appear to subscribe to the old maxim that there’s simply no such thing as bad publicity. They have displayed a talent for remaining newsworthy, certainly on the back pages and not infrequently on the front as well, more or less continually, and dating back to well before their current era of success. The incidents are many, and mostly quite unsavoury – Rooney elbowing a Wigan player and getting off scot-free, dodgy penalties too many to number, the legendary difficulty of seeing a penalty awarded against them and so on and so forth – and yet the default press position remains that the club are pre-eminent in the game for reasons of skill, charisma and courage, an apparent myth lapped up eagerly by the global fan-base, most of whom have never seen the team play in the flesh. We hear far too much also of Ferguson’s so-called “mind-games”, a phenomenon particularly beloved of the media in this country, but one which appears to consist largely of an elderly gentleman having great difficulty sticking to the path of veracity at those press-conferences he deigns to attend. Madrid manager Jose Mourinho is one who prospers in these psychological duels – in Ferguson’s petulant absence after the game last Tuesday, he stated that “the better team lost”, and walked off, content at having fanned the flames of the Man Utd manager’s fury. It seems though that UEFA are after all to look into Ferguson’s failure to turn up for the press after this latest controversial occasion. Presumably they will investigate fully, and a technical charge of “Sulking” might just possibly ensue. But it would be unwise to place too much money on such an outcome; it may well be that we’ll yet again hear those old, familiar words “no further action will be taken”.